Are you looking to install a new kitchen sink? 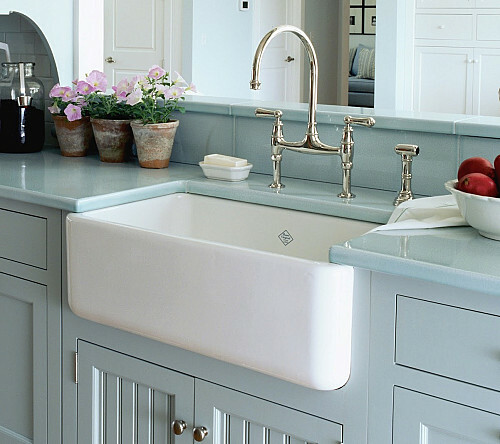 Fireclay sinks are uber popular in today’s kitchen renovations … and rightfully so. Fireclay is an extremely durable material, handcrafted of high quality clay which is fired at extremely hot temperatures. Find out more as Networx interviews a fireclay sink expert from Quality Bath. Why is fireclay so popular for farmhouse sinks? 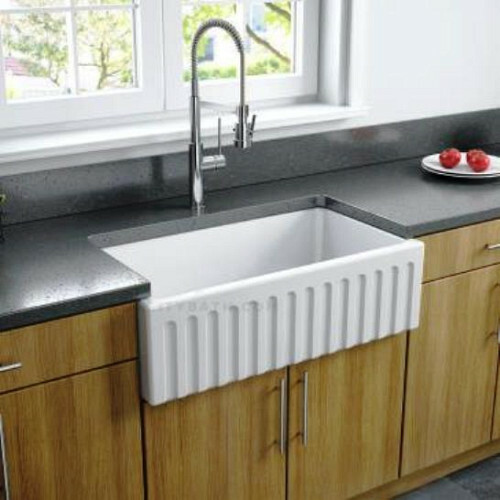 A fireclay sink is a very bold, beautiful look, which makes it the focal point of your kitchen. Traditionally it’s used in country kitchens, but I’ve seen it in very modern kitchen remodels, too. What sink styles are available in fireclay? Most of the ones we sell are the farmhouse (apron-front) style, but we do sell some undermount as well. Drop-in is available but it’s not very popular right now. In the farmhouse style, you have some sinks where the front is just solid and smooth. Others are fluted or have a unique design such as an inset – those look especially nice with Shaker cabinets. Several companies make the farmhouse sinks reversible, one side flat and the other with a design, so you can install it whichever way you prefer. For every 15 sinks of this type that we sell, probably one would end up installed with the design on the front. Now that everything’s going more modern, I think the smooth side gives the sink a more contemporary look. White is the Number One color. Some brands offer "biscuit" (a creamy off-white) as well. Is there a size that you’d recommend? If you have a large kitchen, I think the bigger the sink, the better. Many city apartments that we do are small and they wouldn’t be able to use the larger sizes. But if there’s room, then I’d say the 30 or 33 inch would be the best choice. Keep in mind that you’ll need a base cabinet 3 inches wider than the sink to allow for installation. In other words, to accommodate a 33-inch sink, you need a 36-inch cabinet. Are most contractors able to install this type of sink? Does the installation require any special sort of training? Most contractors can install farmhouse-style fireclay sinks. Installation is a little bit trickier than with a regular sink, because they do need to know how to build the supports to hold the sink in place, but there are very clear instructions. Several installations are possible; for example, you could have the sink sticking out several inches in front of your counter or it could be flush. Can you install a garbage disposal in a fireclay sink? For non-fireclay sinks, the garbage disposal screws into a flange, a little ring that sits in the sink bowl. 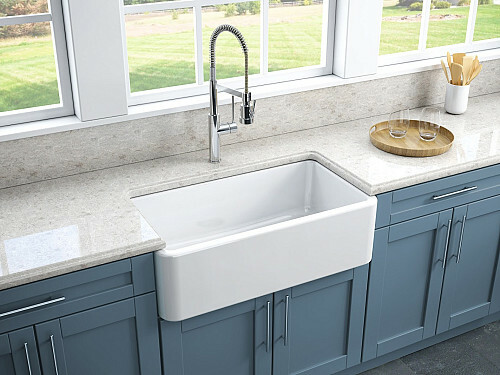 However, some fireclay sink models (such as Rohl’s apron-front) are very thick, so that the flange is not deep enough to extend through the sink and connect to the disposal on the bottom. These would require an extended flange. How sturdy are these sinks? They’re extremely durable and heat-resistant, although you can’t put a boiling hot pot straight from the stove into the sink. Most manufacturers warranty fireclay sinks against staining and fading. Many brands offer a removable grid at the bottom, a stainless steel rack to protect the sink from scratches and scuff marks. What are your special tips for cleaning and maintenance? Clean your fireclay sink using a soft sponge or cloth with soap or a mild abrasive, Daily cleaning won’t harm the durable glaze. If a metal pot happens to leave a mark on the surface, Rohl recommends removing it with Astonish cleaner or Bon Ami. How does fireclay compare to stainless steel or porcelain? First, in terms of appearance, fireclay gives a smooth, clean look. Aluminum is more everyday. Also with aluminum (unlike fireclay), you see water marks easily, so they need to be wiped down frequently. Porcelain is similar but fireclay is a lot more durable.